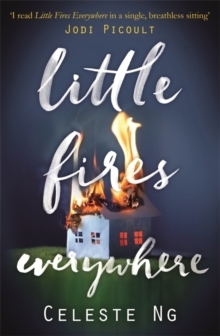 'I read Little Fires Everywhere in a single, breathless sitting' Jodi PicoultThe brilliant new novel by the author of the New York Times bestseller, Everything I Never Told You. Everyone in Shaker Heights was talking about it that summer: how Isabelle, the last of the Richardson children, had finally gone around the bend and burned the house down. In Shaker Heights, a placid, progressive suburb of Cleveland, everything is meticulously planned - from the layout of the winding roads, to the colours of the houses, to the successful lives its residents will go on to lead. And no one embodies this spirit more than Elena Richardson, whose guiding principal is playing by the rules.Enter Mia Warren - an enigmatic artist and single mother- who arrives in this idyllic bubble with her teenage daughter Pearl, and rents a house from the Richardsons. Soon Mia and Pearl become more than just tenants: all four Richardson children are drawn to the alluring mother-daughter pair. But Mia carries with her a mysterious past, and a disregard for the rules that threatens to upend this carefully ordered community.When the Richardsons' friends attempt to adopt a Chinese-American baby, a custody battle erupts that dramatically divides the town and puts Mia and Mrs.
Richardson on opposing sides. Suspicious of Mia and her motives, Mrs. Richardson becomes determined to uncover the secrets in Mia's past.